Let’s pretend for a minute that it’s 1999. What would your day look like? You’d wake up with your radio alarm clock –check your PDA to see what your schedule was like for the day. Maybe you’d find out that a film you rented was due back at the video store. Once you arrived at work, the fax machine might have been your next stop. If you were a student, the library may have been where you spent your day – doing research and using the card-catalogues to find materials. If you were expecting a call, you couldn’t travel very far from the landline. . Hopefully no one was on the internet, because no calls could be made while someone was online. As for bills – they came in the mail! No, not e-mail. Physical mail; ‘snail mail’. These were things that people couldn’t live without just a short decade ago. Today, they are all but obsolete. Here is a humbling thought – how many jobs died out with these staples of life? “As we create these new automations, it eliminates 10000 jobs at a time,” Thomas Frey, Futurist and former engineer and designer for IBM. We’ve already seen a humbling amount of companies go belly up in the last 10 years. Titans like Blockbuster and Rogers Video have died out and even staples like Canada Post isn’t immune, cutting 8,000 jobs and phasing out door-to-door delivery. Thomas Frey goes onto theorize that by 2013, half of the jobs that are currently in the west will either have transitioned into something else or be completely gone. Need an example? Check out this blog entry that WE WROTE about the rise of the Chief Digital Officer, and how that position is pushing out the CIO and CMO. Jobs and careers are shifting and changing, but are universities keeping up? The numbers would suggest NO. Why such a large drop in numbers? One plausible theory is because the retirement age has been delayed. For the first time in quite a while, the younger generation is competing with the older one. With jobs dying out and becoming automated, there just aren’t enough skilled positions to go around. That leaves slim pickings for even unskilled or low-skilled positions. Low skilled jobs refer to work that requires no specific education or experience. Jobs that don’t require a university or college degree. Which at first glance, might seem like a good thing. Post-secondary education is expensive and the methods of it aren’t for everyone. Despite this, a record number of Canadian youth are going to university. 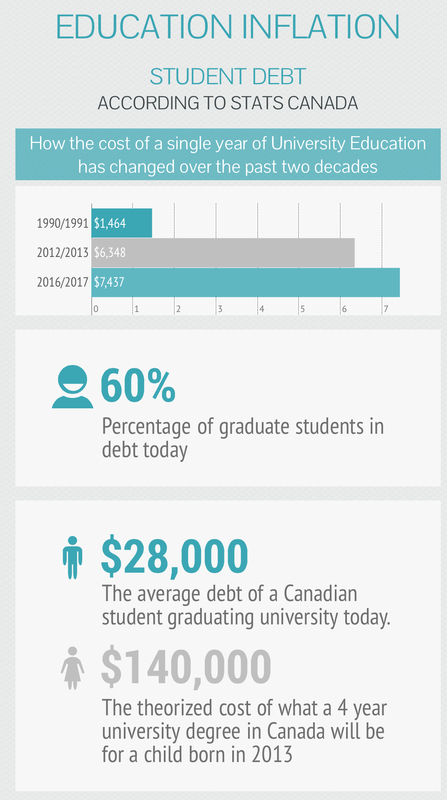 As of 2011, approximately 75% of the Canadian under 30 population had gone to university. That leads to Education Inflation. Education inflation works on the same idea as economic inflation. As more and more people get degrees, those degrees become less valuable to employers. Where a Bachelor degree may have done 10 years ago, a Masters is now needed. Post-secondary education is no longer optional. A Bachelor of Arts, Bachelor of Science or a Bachelor of Commerce are now almost expected to be had after high school. Which means those same degrees could be looked at with the same regard as a very expensive high school diploma. Couple this with the advancements in technology, which is causing more jobs to die out. In Canada, you essentially have a situation where universities are charging to prepare students for jobs that aren’t needed, or don’t even exist any more. Graduates are entering a job market that doesn’t want or need to hire them with thousands of dollars of debt. This contributes to the widening gap in Canada between the haves and have-nots. No training = no funds=no progress. This could be a catastrophe down the road. Increasingly, countries success depends on the skills its citizens have. If the young people aren’t getting the training, they won’t develop the skills that will be needed when the older generation finally does retire. When that happens, who will buy the houses, who will pay for the social programs, and who will adapt to the new jobs? Who will be the innovators that drive the Canadian economy forward? Will Canada be a country without any innovations or skills? Will other countries who have been training and hiring their youth well sweep in to take the power and innovation that Canada has enjoyed for the last few decades? There are 34 countries in the OECD, and those include Korea, Slovenia and Chile. That could mean that in a few short years, there could be 33 countries ahead of Canada leading in innovation, technology and useful skills. The plight of the young workers in Canada is not an isolated problem. It could affect everyone.